Richard Norris, Ph.D., director of the Center for Plant and Life Sciences (CPLS) at St. Louis Community College (STLCC) located at Bio Research & Development Growth (BRDG) Park on the Danforth Center campus was recently named President of the St. Louis Agribusiness Club for 2016-2017. For the past 10 years, Norris has been a member of the Club serving on numerous committees and he also held the position of Secretary from 2014–2015 and 1st Vice-President in 2015-2016. The St. Louis Agribusiness Club is comprised of over 450 forward-thinking members who work for St. Louis-based enterprises. The group connects for monthly luncheon meetings (September – May) to discuss important agricultural issues and inform the public on industry topics involved with the food, fiber and biofuel industries. 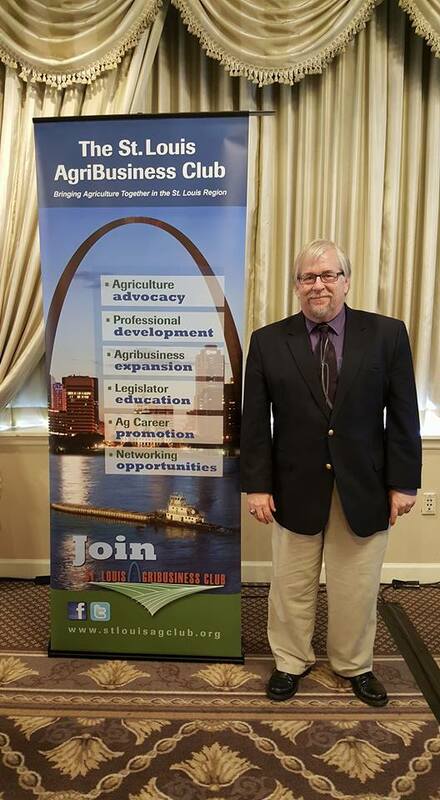 In addition, the Club works with organizations around the region to attract agricultural companies to the area and plays a key roll in ensuring government officials understand the importance of agriculture to not only the St. Louis area, but to the world. Norris has been a key player in the effort to grow the region’s plant and life sciences ecosystem through his leadership of the CPLS, working to support the Florissant Valley Biotechnology and Life Science Lab Assistant programs which provide the workforce necessary for companies and academic institutions to achieve success. Under his direction over the past 17 years, the talented team at STLCC has expanded the program and created a national model for training skilled hands at the bench. In fact, the Biotechnology program boasts a 91 percent job placement rate after graduation, with a full 34 percent finding full time employment directly as a result of their internship with a company. This hands-on, 71-credit program is ideal for students looking for a career in biomedical, forensic, pharmaceutical, bioengineering, microbiology, environmental or academic laboratory science and serves as a key component to training and mentoring the next-generation of scientific minds in the thriving agtech community here in the St. Louis region. “Even during the tough economic times we have seen in recent years, our graduates from the Biotechnology program are finding good jobs in a growing industry, right here in St. Louis,” said Norris. Interested in joining the Club? Norris invites you to email him personally with any questions or to find out general information: rnorris@stlcc.edu. Also, check out the Club’s calendar of events here.